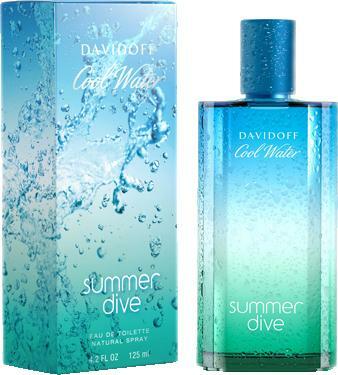 Davidoff - Cool Water Summer Dive (M) ? Limitált kiadás! ? Illatcsalád: Aromás- aqua ? Megjelenés éve: 2011 ? Illatösszetétel: Citrom, Mandarin, Grapefruit, Bazsalikom, Zsálya, Borókabogyó, Vizes és fás jegyek ? Töménység: Eau de Toilette Spray (EdT) ? Leírás: Waves of freshness under the sun? ? Story: A sparkling blue fragrance, Cool Water Summer Dive is ideal to keep men ?cool for summer 2011, even when temperatures rise?. ?Clear blue skies, hazy white horizon and aqua green sea make the perfect backdrop for this ultra-fresh scent?, confides Davidoff. This oceanic-aromatic limited edition scent promises ?an intense sense of freshness and vigor for a real breathtaking experience?. ? Parfume description: The citrus opening of the fragrance combines lemon, mandarin and grapefruit. The heart blends basil, juniper and aquatic notes. The base is a mix of sage and woody notes. ? Bottle: The original bottle shades from blue to green, ?from brilliant sky blue to alluring ocean green?.